Many instructionals take submissions as their focus. After all, that is what a lot of people find most exciting in BJJ: getting the tap in the most unorthodox and flashy method possible. Submissions are of course important, as from a competitive perspective, successfully applying a submission will instantly win the match, no matter how many points you may be down. Offence is all well and good, but in order to have an effective offence, you need great defence. If you're confident that you can get out of bad positions, then that will make your attacks all the more dynamic: solid defensive skills enable you to take more risks. 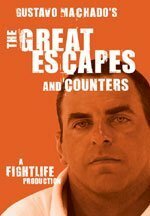 This is where Gustavo Machado comes in, with his 2006 release, The Great Escapes and Counters. Over the course of around two hours, Machado demonstrates how to deal with the most common attacks and positions in Brazilian jiu jitsu. The DVD is split into thirty-six sections, though in some of those several variations are covered, so it ends up being over forty different techniques. That makes for a fairly comprehensive selection, comprising of the cross choke, ezequiel, Americana, Kimura, armbar, triangle, omoplata, guillotine, crucifix, rear naked choke, bicep slicer, arm triangle, anaconda, Brabo, ankle lock, side control choke and baseball bat choke, along with positional escapes from side control, scarf hold, north-south, cradle, knee-on-belly and mount. Generally Machado spends around three minutes on each technique, starting by briefly showing the submission itself, then walking you through the escape from two angles, and finally showing it full speed. Though most of the demonstrations are around the three minute mark, it does vary, and on top of that, with some submissions Machado splits each escape into a different section. For example, Machado shows four different options for getting out of the triangle choke, each one in a separate segment of between two to four minutes. By contrast, he tackles the armbar from mount in one five minute chunk, covering three variations. Normally Machado will also cover a submission escape from several positions, like the kimura from top and bottom half guard, along with closed guard and side control. That obviously depends on the versatility of the submission: escaping the rear naked choke is only shown from the back mount, as you'd expect. The explanations are reasonably clear: Machado speaks good English and is obviously a competent teacher with an eye for detail. This is further helped by the camerawork, which zooms in and out to pick up on fine points. Importantly (though this might seem trivial), Machado's training partner Tinguinha (who has his own range of DVDs out on the same label) is wearing a blue gi. There are a lot of instructional which are definitely hindered by both people wearing the same colour gi. Having one with a white and one with a blue (or just anything that isn't white) gi is a small point, but it greatly helps to reduce confusion when limbs are getting all bundled together. All in all, this DVD makes for an excellent reference tool if you keep finding yourself getting caught in certain submissions. It isn't a bad purchase for beginners, as it does cover the basics, but there isn't enough coverage of things like side control and mount escapes for somebody new to the sport. As ever, Blue Belt Requirements is still the first DVD I'd recommend to anyone starting out in BJJ, but Machado's DVD is a good later purchase. You can buy it as a download from the publisher, Fightlife, over at their site for $39.95, or as a DVD (both formats are the same price).